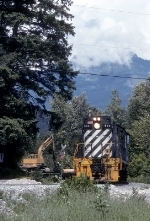 Description: BC Rail RS18 601 was switching the Squamish, BC, yard on May 29, 1992. Description: This was a local working north. Description: BC Rail RS18 626 with the local freight consisting of one car of lime, Kelley Lake, BC May 28, 1992.